The smell of my farts wake my mom out of a sound sleep. Posted January 21st, 2013 . There is nothing quite as bad as a Boxer fart!! I have been jolted out of a dead sleep more than once! Doesn’t matter what you feed a boxer, he will still stink! We even asked our vet because we thought something was wrong w him!!! She said nope,just a boxer trait!!! Not true at all. Boxer’s digestive tracks are very sensitive, but find the right food and the horrible smell will diminish drastically. I’ve had many Boxers and each one had a different food brand to make the smell go away from Solid Gold to Blue Buffalo Basics and a few other ones (not trying to push any brands here). Avoid treats while testing out foods and take about a week or more to slowly change brands by mixing the new food in slowly. Good luck. Our boxer was known for his silent but deadly farts. I love that Boxer face! Great face! He reminds me of some old humans. That face is like, “I am old. Leave me alone”. 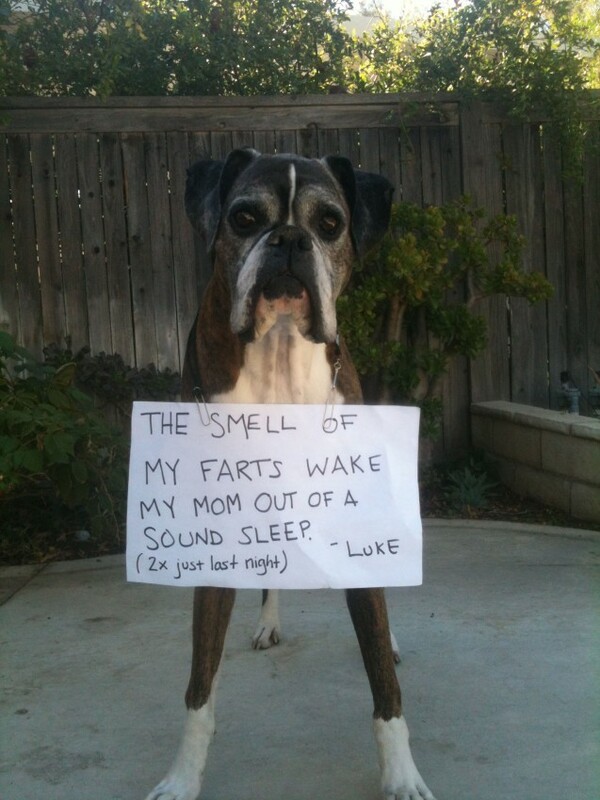 Boxer farts are the worst ! They can peel wallpaper! Plain yogurt helps immensely. And they love it.